Your oilskin smelly, dirty or mouldy? This detergent will get it clean and smelling fresh again. 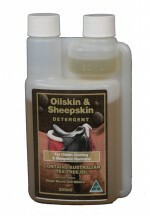 Oilskin & Sheepskin Detergent: ► Can be used for washing oilskin without destroying the waterproof finish ► Antibacterial / antifungal stops mould and mildew ► Destroys bad odours ► pH neutral detergent ► contains blend of melaleuca oils including tea tree and lemon myrtle – so it smells good! ►&.. Whether your coat will require re-proofing depends on the amount and type of usage your coat will get. With normal wear you are unlikely to need to re-proof your oilskin for at least 10 years. Because many of our coats last for decades and are handed down for up to 3 generations, we have 2 re-proofing products available. A pump pack product, Oilskin Reproofer which is handy for reproofing small areas such as the seat of motor cycle pants; and a can of the original wax proofing treatment called Coat Dressing which is used when you want to reproof the entire coat. ..
A convenient way to maintain your oilskin. 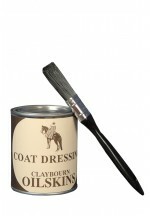 Whether your oilskin will require re-proofing depends on the amount and type of usage your coat will get. With normal wear you are unlikely to need to re-proof your oilskin for at least 10 years. Because many of our coats last for decades and are handed down for up to 3 generations, we have 2 re-proofing products available. 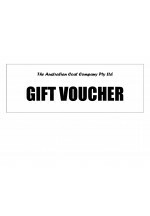 A pump pack product, Oilskin Reproofer which is handy for reproofing small areas such as the seat of motor cycle pants; and a can of the original wax proofing treatment called Coat Dressing which is used wh..